After President Trump declared a national emergency Friday to fund construction of a wall along the U.S. southern border, several Bloomington groups organized a protest against the wall Tuesday at Sample Gates. About a dozen people were at the protest, which started at 11:30 a.m. They held handwritten signs and banners with messages in support of immigrants and against the president, U.S. Immigrations and Customs Enforcement and the border wall. The protestors waved at cars honking in support of them as they drove by. The president announced the emergency declaration after Congress passed a spending bill that did not include the money he wanted for the wall. 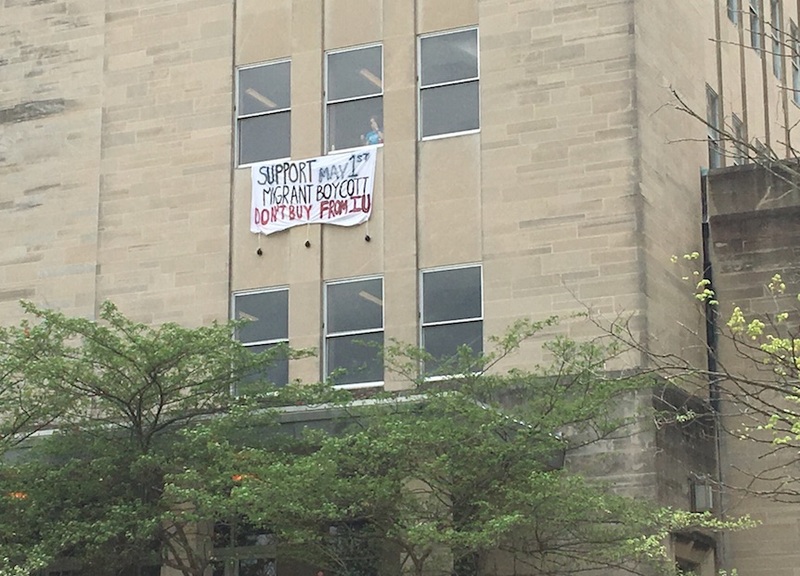 The idea for the protest in Bloomington came from IU on Strike. According to the group’s Twitter biography, it organized a strike in April 2013. “Can we mobilize here in #Bloomington against the #FakeTrumpEmergency and to support asylum-seekers? We can help deal #blockthewall and block Trump,” the group tweeted. Room 1B of the public library. As the situation for immigrants in the United States becomes even more dire with the unfolding DACA repeal, it is important to consider contributing historical factors in an international context. This educational panel includes presentations and personal testimonies from the director of a migrant shelter in Mexico, a graduate student researching migrant crises, and activists fighting for immigrants’ rights in Indiana. Join us in learning about and discussing how state violence in the forms of displacement, detention, and deportation produce a vicious cycle of isolation, desperation, and poverty. – Ramón Marquez, director of the La 72 migrant shelter in Tenosique, Tabasco. Co-sponsored by the IU Department of History, IU Center for Latin American and Caribbean Studies, and IU Latino Studies Program. Here is the FB event. Please share this information with your students, colleagues, and classmates! 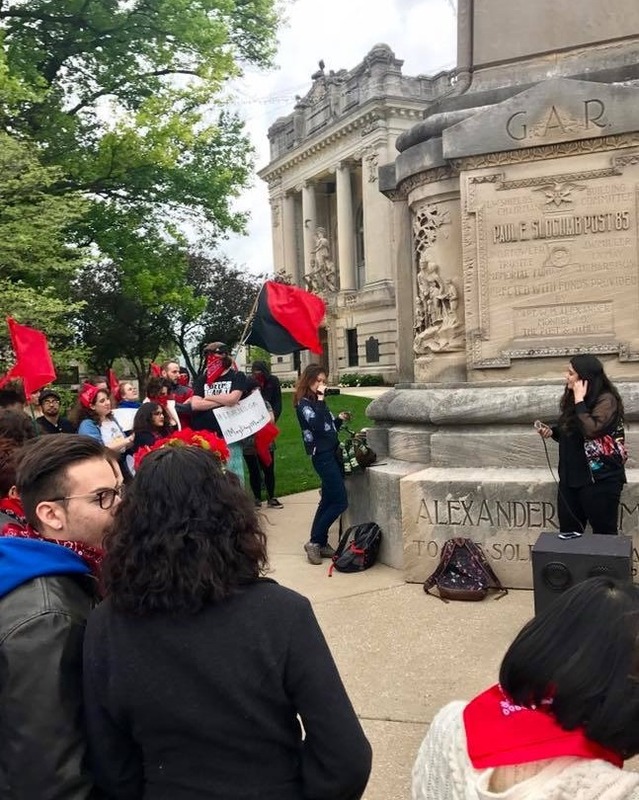 On May 1st, 2017 Bloomington, Indiana joined the largest immigrant strike since 2006. The Bloomington May Day Group, a group of five Bloomington residents (including undergraduate and graduate students, and alumni) working as part of Cosecha Indiana, hosted a rally, a march, and a financial boycott to demand permanent protection, dignity, and respect for ALL immigrants in the country, regardless of country of origin/heritage, race/ethnicity, gender, religion, sexuality, socio-economic position, status under the law, etc. These actions were a direct response to the call for a day-long Migrant Boycott made by Movimiento Cosecha, a national movement devoted to the advocacy for the over 11 million immigrants in the United States, many of whom are undocumented. Bring the migrant strike to IU, confronting the politicians in Indy who passed SB 423, the sanctuary campus ban! At a time of increasing state racism, we must defend university autonomy against those who would interfere with higher education in the name of discrimination. community. In solidarity with the migrant strike, we will not go to work, we will not go to school, and we will not buy. We must push back against the looming threat of the Muslim ban, cuts to the social wage, and ICE holds in the local jail. The march from Sample Gates to the courthouse will be accessible. If possible, please wear red or a red bandana all day to show support for the migrant strike! 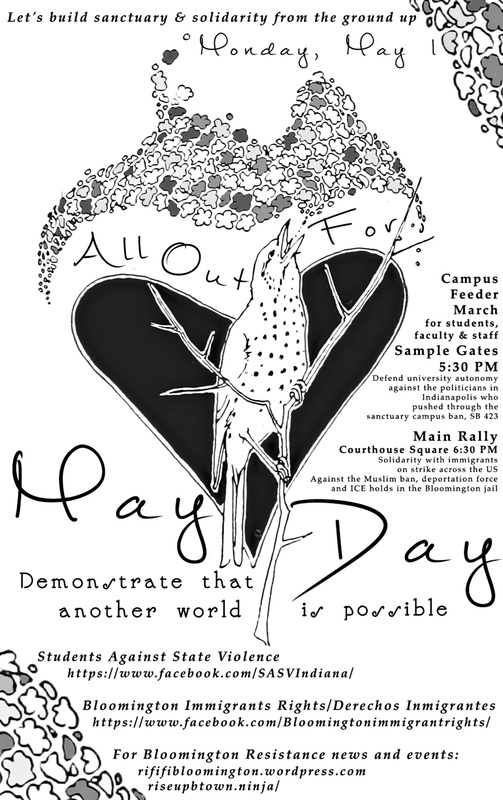 Workshops, organizing, rally, all at Inaugurate the Revolution. Autonomous night demo, meeting at People’s Park at 8:30, with more details here.